Remember that law that prohibits tv commercials from spiking the volume? It was formally known as the CALM Act - Commercial Advertisement Loudness Mitigation - and it goes into effect today. Shhhh! A new law says TV ads can't blare anymore - US News and World Report I'm looking forward to it, but suspect advertisers will find other creative ways to annoy us. The law was passed a year ago and the industry was given 12 months to begin to comply. I've already noticed a marked improvement. Can't recall the last time I yelled obscenities at a commercial for being way too loud. One thing I noticed immediately about the Hulu+ ads was that they were so much quieter than the usual TV ads, making the whole viewing experience so much more pleasant (less jarring). I assume those "Internet" ads are out of the realm of this new rule. I imagine many of us have gotten very, very good at pressing that mute button. I haven't seen any impact yet, still loud. It's varies from channel to channel. It seems like there are more commercials than ever before. I swear there is 5 minutes of commercials for every minute of programming and it doesn't matter what channel I flip to.. it has a commercial running. I dropped cable. No sense in paying to watch ads all the time. Almost no content now. Too many commercials plus the new technique of going over what was just said before the commercial when its over. Maybe 15 min of content per hour. Life is too short. In theory, theory and practice are the same. In practice, they are not. Here's the FCC link with the phone number to call. I hope this has teeth and not like the "Do not call" phone list. Any loud commercials and I will give it a try. I have the number written down on a pad nearby. Yeah. We need ad block software for TV's. I have a TiVo recorder. If I am planning on watching live TV, I will usually let TiVo start recording it when the show begins, as I do something else (watch another pre-recorded show, read a magazine, putz around with something else) for about 20 minutes or so. Then I'll start watching the "live show" from the beginning...as TiVO keeps on recording it. That way I can watch the show, fast forward through the commercials, and see an hour show in less than 40 minutes, uninterrupted by commercials. It's great. Now just imagine... you're watching a movie, and the commercial comes on so loud it wakes up your wife. 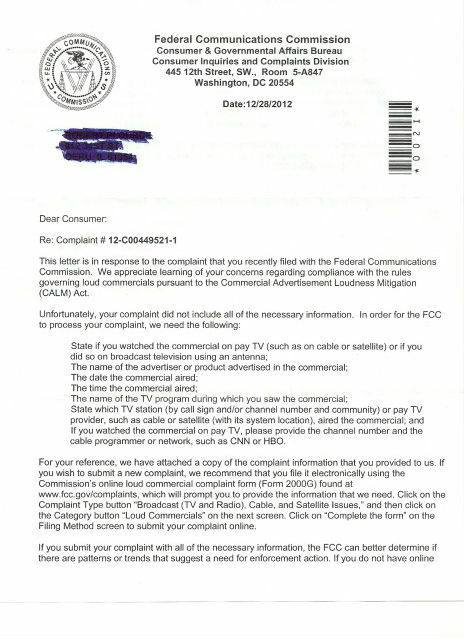 Mad as hell, you go on the internet to the FCC government website to complain. Takes few minutes to find the complaint page, but you're mad, and wanna straighten the scofflaws out... You do your best but it isn't a simple process. Here's the reply I received today. A six page letter (finished with the ultimate insult... a paragraph about the paperwork reduction act. Here's the first page... Note the reason my complaint can't be processed. And that was just page one of 6. Now... even worse.. They suggested that I go online and download the formal complaint form... and sent it in. For a loud commercial that I watched back the week before Christmas. $.45 to mail, $10 for the handling and processing the letter to me. Oh... by the way... The FCC is congratulating themselves on the great results, since the law went into effect... They have only received a few complaints. All times are GMT -6. The time now is 04:11 AM.